The Atlantic coastal drive, which starts off as Victoria Road, has some of the most spectacular coastal scenery in the world and is popular with outdoor enthusiasts, surfers and sea kayakers. Whales visit the coast (June to November) and the road between Kommetjie and Scarborough offer some of the best view sights in Cape Town. Most of these beaches are well protected from the south-easterly wind which makes it perfect for sunbathing. With ocean temperatures ranging from 10 - 14 degrees C, it's more about showing off than swimming. The culture of these beaches is rather up market and fashionable and this is where you will find the trendy coffee shops, restaurants and bars. 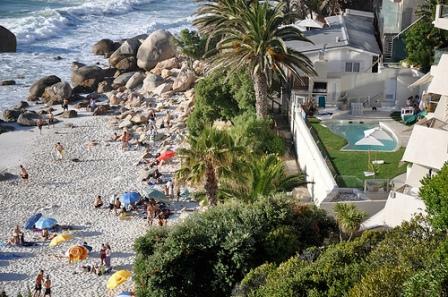 This stretch of Cape Town coastline is also home to some of the most expensive real estate in South Africa. Cape Town Hotels-Atlantic Seabord Map. Below is a handy clickable map which you can use in your search for accommodation in this part of the Cape Peninsula.